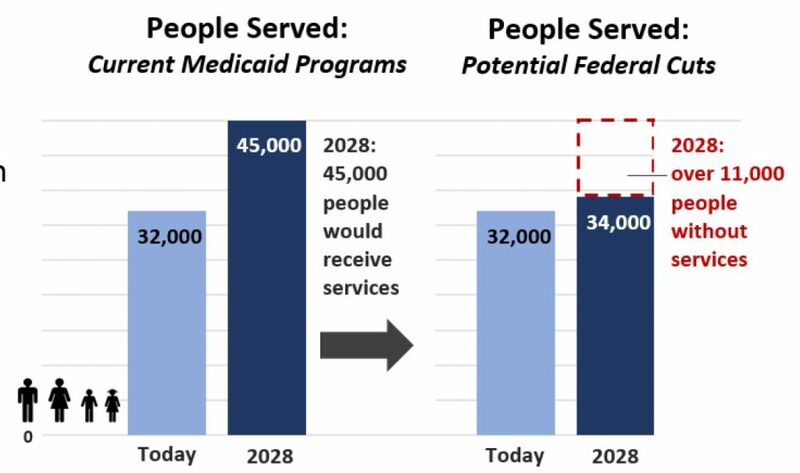 What Would Cuts to Medicaid Look Like? What would potential Medicaid cuts mean for Washington children and adults with developmental disabilities? Right now in Washington, over 32,000 people with developmental disabilities depend on Medicaid-funded long-term services and supports. By 2028, that number is expected to be at least 45,000. These critical day-to-day Medicaid services include personal care, residential, respite, nursing, employment and other services that keep people safe and healthy. Today most Washington residents with developmental disabilities receive care from family members. As these family caregivers age, the need for paid caregivers will rise. Learn more about the impact of Medicaid cuts to Washington residents in this one page fact sheet developed by the Washington State Developmental Disabilities Administration.